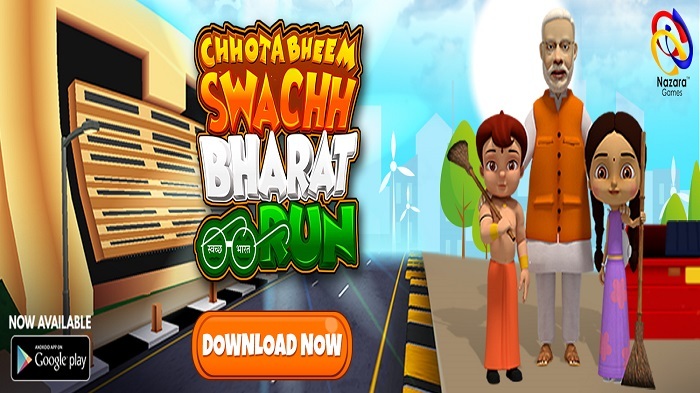 One of India’s leading mobile gaming company, Nazara Technologies, today announced the launch of their new game Chhota Bheem Swachh Bharat Run’. The game is inspired by prime minister Narendra Modi’s Swachh Bharat Abhiyan. This is a part of Nazara’s Play4Good initiative wherein a mobile game is being used to educate young children with good values to keep their surroundings clean. In the game, the main character and also the superhero for millions of children, Chhota Bheem, race to clean up the streets and areas across different cities of India and collects all the trash in nearby dumping zones. The game has a daily and weekly contest with inbuilt leaderboards and contest winners will become part of the Swachh Bharat Army inspired by Modi. Members of Swachh Bharat Army will receive exciting merchandise. Chhota Bheem is setting up an example to other children to follow his lead and is taking the Swachh Bharat Abhiyan message forward to the children of India. The game is live, it can be downloaded on Google Play Store. Nazara has over hundred million downloads of mobile games developed for children around massively popular local Indian characters apart from Chhota Bheem like Motu Patlu, Mighty Raju, Shikari Shambhu among others.